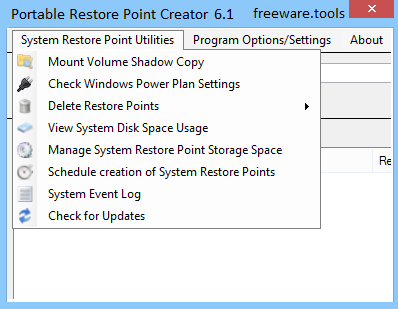 Restore Point Creator is a simple program for the quick and easy creation and management of system restore points. No more drilling through multiple menus in Windows just to create a System Restore Point, now all you have to do is run this program, and that’s it. Just pin this program to the Taskbar and you have the ability to create quickly System Restore Points using one of the two pinned Tasks (“Create System Checkpoint” and “Create Custom Named”) that the program creates. It’s that simple. Create System Checkpoint – Creates a System Restore Point with the name of “System Checkpoint made by System Restore Point Creator.”No installation is required to use this tool. Keeping the system updated and with all the important files backed up is essential if our goal is to avoid losing vital data, instead of spending entire hours to fix things in case a crash occurs. The simplest method provided by Windows is through the creation of system restore points. However, managing them can be a bit tricky, so a specialized tool would be recommended. Among the dedicated utilities that were made for this job, Portable Restore Point Creator aims to simplify as much as possible everything for you. Able to run without requiring installation, you can carry and run it from a storage device. As soon as you run this program for the first time, it will scan the PC and identify all the restore points that have been created so you can view them alongside the corresponding details. Thus, you can view the description and date of creation for each restore point, as well as its type. It is possible to create a checkpoint with a single mouse click and restore your system to an earlier state just as easily. The restore points on the list can be deleted in order to gain more disk space and this operation should be carried out regularly, especially on drives with limited free space. Scheduling the creation and deletion of restore points is also possible through this tool, along with the management of storage space used when making them. You can configure how often the old checkpoints should be removed as well as the frequency of creating new restore points. All in all, given the quite good feature set that Portable Restore Point Creator comes with, coupled with its ease of use, the application should attract a lot of users. The only major downside at this time is the lack of a true portability.